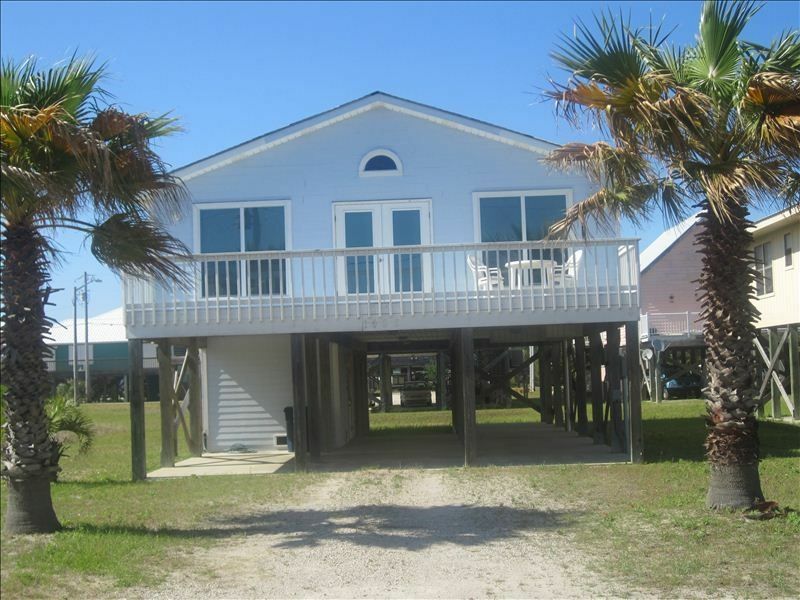 Escape to the 'Purple Passion', a relaxing beach cottage on Gulf Shores' West Beach! 'Purple Passion' Beach Cottage is a comfortable beach house located just a short walk to the beach. You can relax on the deck and watch the breath taking sunsets. Listen to the waves break in the surf, while enjoying the beautiful Gulf views. The back screened porch offers views of Little Lagoon. The 'Purple Passion' is a spacious 3 bedroom, 2 bath beach house, decorated in bright, colorful colors. The open floor plan features a cathedral ceiling which covers the living room, kitchen and dining area. Sunlight floods this bright and cheery beach cottage. The master bedroom has a queen bed, with it's own bath and opens up to the screened porch. The 2nd bedroom features a queen bed, and also opens to the screened porch. The 3rd bedroom houses bunk beds. The living room sofa also opens up to be a sleeper. Parking is available for 2-6 cars (covered for 4) directly under the house. SNOWBIRDS WELCOME! Location location location...Solid house needs A LOT of TLC. The master bed was comfortable, have no idea about the other beds we didn't sleep in them. Kitchen had everything you could need and then some. Beautiful view, very short walk to the beach. Grill, sand toys, chairs all there...again pretty much everything you might need is here. Surprisingly quiet area with the couple of midsize condo units nearby. If you don't care about the complaints the other reviewers had then stay here...IF the price is right...for the price we paid and for the condition of the house I feel we overpaid. The complaints others had are spot on and haven't been fixed...but the a/c works great it stays cold in there so is that a legit complaint? Deck boards are bad-need deck over paint and a hammer to pull the nail heads sticking up-just no excuse for it to be like that-hopefully this will be fixed soon as it really is a hazard. We didn't use washer or dryer but saw the hose-again fix this soon. The cleaning crew-not sure what they do besides vacuum-no deep cleaning done in years and it shows-no pride in their work. There were many broken/cracked tiles...but that is a matter of bad/cheap installer and/or not knowing what materials you should be using and/or lack of taking pride in your work-same as with the cleaning crew. If you are going to have a screen porch...then fix the broken screens-otherwise take the screens down. If you love purple, this is the place to go. If you want to be close to the beach (AND if the price is right) this is the place to go. If you want a sparkling clean condo and can't tolerate the complaints then don't stay here...BUT good luck because this is pretty much the same problems everywhere and I have stayed at some really expensive places that had similar issues-just enjoy your stay...you are on vacation at the Emerald coast (Redneck Riviera). The front deck boards are very week and nails stick up with week railing. Blinds broken, walls marked up leaving to wonder why you are changed for cleaning, among other things. The house just isn’t what you see in the pictures and was very disappointing. Great rental very close to beach and lagoon. The property is shabby. Ants in the bath Tub and kitchen. Sink in kitchen had black streaks which my daughter got off with Clorox,Air return for air conditioner was so dirty air could not get thru, sinks in master did not drain well,Rust in refrigerator,Dirt sofas Broken chairs, and to catch the lent from drier was caught in a ladies hose which I think is a fire hazard. I know it can be done differently as I had to do it one time.Do not think that is my idea of a lovely beach house!!!! Location was awesome! The owner was very responsive when we had an issue. WE had a few issues with the house. There were ants everywhere in the kitchen. The ac went out (which cannot be anticipated) & it was repaired very quickly. The location was awesome & would stay there again just to have the same location again. The lights were out except for 2 underneath the house so it was a little difficult to stay up & play games at night. I feel like I sound negative. I don’t mean to be. We had a great week. There was lots of room for all of us. Roomy with close proximity to the beach. Our group of 7 people ages 5-60+ all had a wonderful time here. The beach was a block away and very easy to walk to for all of us. The house has plenty of room and a nice deck in the front and the back. We would be happy to stay again! I'm happy that you and your group had a wonderful time at the "Purple Passion" Beach House. Our goal is to help make your beach vacation a wonderful experience. I look forward to you all staying again!